Nessus, of course, is the fifth map in Anderson's Inferno series, a replacement for MAP07 featured among id's Master Levels for Doom II. At Anderson's own admission, it's primarily a deathmatch map, which shows in its bilateral symmetry, from north to south and from east to west. It plays significantly better in single player than some other primarily deathmatch maps I've played, though (specifically some of the H2H-Xmas entries). 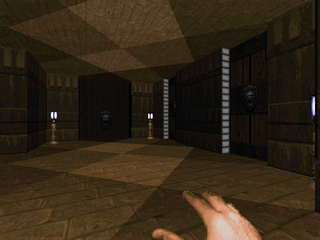 This is primarily due to Anderson's intelligent use of monsters and traps which complement the deathmatch layout. Stylistically, it's like the previous five cantos, except this one's exclusively the brown brick and metal theme which he's so fond of. You can section this map into an indoor central area that's on a raised level compared to two, nearly identical outdoor areas with indoor staircases at each end. It looks very nice and as mentioned there are some nasty traps, like instantly lowering platforms, false walls, and fight-or-flight mancubuses. Mixed in with your relatively exposed position both indoor and outdoor, it makes for a heart-thumping encounter, at least until you open up some breathing space. Otherwise, it's not much of a challenge, as the outer courtyards lack obstacles of any sort, with their large areas facilitating player mobility. Detailing and lighting are up to Anderson's usual impeccable standards. My favorite moment really is the aforementioned false wall. You figure out revenant rockets are coming out of it, but can't just poke your head in at a cautious pace or you'll probably take one in the face. So you walk in, see the revenant, and maybe like me you try to half run up to it to prepare for the SSG hit...only to fall into the pit that wasn't so obvious due to the darkness, and you walk smack-bang into a mancubus. Along with the cages and overlooks, it really helps solidify the central area as the most interesting in the map. Nessus is a fun interlude in Anderson's INFERNO series. The overall experience isn't quite up to his previous efforts, especially when following a larger adventure like his MINOS. Part of that is due to its emphasis on deathmatch, though (as previously mentioned) Anderson has done an honorable job in placing monsters in such a way as to complement its layout. Its quality and polish, however, more than earn its spot among the rest of the Master Levels for Doom II.